Nun Bowling Kit: It's Sinfully Fun! 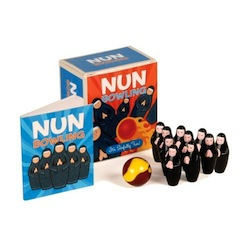 Home > Books > Miniature Editions & Kits > Nun Bowling Kit: It's Sinfully Fun! Nuns have had a great run. Ever since Sister Act established they could be cool and fun as well as severe and scary, the habits have been flying into stores and off the shelves. As a great addition to the new trend, this deliciously fun bowling set presents ten praying nun pins, one Satanic fireball, and 32-page introduction to the nun bowling sport. Many adults still have nun-phobia left over from their childhoods. This kit offers a healing experience that, at this price, is the cheapest therapy you can get.